If, like me, you’re fed up with Windows XP SP2’s annoying “Open File Security Warning?”, just create a system environment variable called SEE_MASK_NOZONECHECKS and set it to 1 to disable the feature. 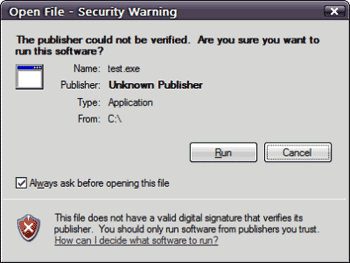 Windows XP and Vista contain a feature that is supposed to help you locate the right program to open a file with an unknown extension. I’ve never found this particularly useful – luckily, it’s easy to nuke it by employing a quick Registry hack. Check out this Lifehacker post for the details.